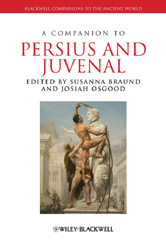 A Companion to Persius and Juvenal breaks new ground in its in-depth focus on both authors as "satiric successors"; detailed individual contributions suggest original perspectives on their work, and provide an in-depth exploration of Persius' and Juvenal's afterlives. Provides detailed and up-to-date guidance on the texts and contexts of Persius and Juvenal. Offers substantial discussion of the reception of both authors, reflecting some of the most innovative work being done in contemporary Classics. ontains a thorough exploration of Persius' and Juvenal's afterlives.